The latest wave of ransomware targets upcoming Windows 10 users by luring them to download an early copy of the operating system, then zapping them with CTB-Locker instead. 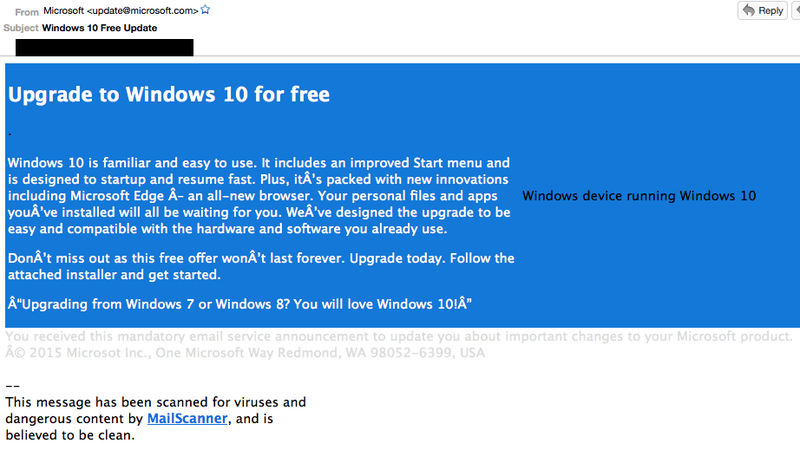 The email enticements impersonate Microsoft, and inform impatient (and gullible) readers that the attached installer will allow them to attain Windows 10 immediately. Ransomware is a type of malware that prevents you from accessing your information by encrypting it. In order to regain control, you must pay ransom — typically through bitcoins or some other form of online payment — in order to regain access to your system. And it’s becoming more and more common. How It Works: You or one of your coworkers clicks on an infected advertisement, link, or email attachment. A pop-up window appears, notifying you that all the files on your computer have been encrypted, making them useless unless you have a key to decode them. The ransom fee typically runs between $300 and $500, but late payers have recently been hit up for several thousand. In addition, corporate victims pay thousands more in lost productivity, third-party IT services, legal fees, and credit-monitoring services. Bitcoins are the coin of the realm because they’re fast, easy to use, and difficult to trace. Popular targets for the scam include smaller law firms, small-to-medium-size businesses, and other organizations that might have less sophisticated protections in place for their computer networks. In a business environment, employees usually trigger the event by clicking on questionable sites and links without thinking, and without checking with the IT department first. And when something goes awry, they often fail to report it for fear of blame. In today’s collaborative and distributed environment, with so many people working remotely, it becomes hard for IT departments to raise awareness, but easy for one affected user to infect everything else on the network. Defending against new waves of malware requires vigilance and a security expert partner to ensure your network is protected and prepared for such an attack. Contact SLPowers today to talk about implementing a multi-layered security solution — in conjunction with impactful employee security training — to mitigate your risk.